I put that sh-t on everything! As I am gaining steam in my weight loss journey, a few questions have been posed to me that I thought I’d take some time to answer. Mostly the questions are around how I am losing the weight, and what foods I am eating, or not eating as the case may be. I am going to write this post as an FAQ of sorts about my weight loss journey. This one is easy. There really isn’t any secret about it. I burn more calories than I take in. That is the tried and true way to lose weight. To reach that state I have increased my exercise for sure, and there are plenty of good reasons to do that apart from just weight loss. But, by far, the biggest reason I have lost weight is because I am eating less. I was talking to a chiropractor at a social event last week. She counsels many of her patients on weight loss, and was interested in my story. As we talked she said something that stuck with me… “you can’t outrun your fork.” Approaching weight loss from the burn side of the equation is a recipe for failure. The best way to get hold of your weight and make it start to go down is to eat less. I can do a hearty workout for an hour, and burn 500 to 600 calories. If I top that off with a fast food burger or a piece of pie, I give back everything I just did. I am using Weight Watchers for Men online. I follow the Points Plus program. I record what I eat and drink, and use the reminders on the site to keep up with things like water intake. I find the program easy to follow and maintain. There are decent tools available to help, and the database of foods on line and in the phone app is extensive enough that I can usually record each meal live. I always seem to slip. How do you stay on track? This one is a little tougher. I have tried and failed many times times in the past to lose weight. Once, back in the year 2000, I was even successful and lost 72 pounds in 15 months. Since then there were small successes, but mostly failures. I gained back everything I had lost then, and added on another 55 pounds. In those past, failed attempts, my mind wasn’t really ready to lose weight. As a friend of mine said in a comment on her blog, my mindset wasn’t right. Without the right mindset I could never succeed. For this time around my head is in the right place, and I have taken a different approach in terms how public or secret I am making my progress. In the failed attempts I was secretive. I didn’t want to start to lose weight and fail publicly, so I decided to keep it quiet. Ultimately that was the exactly wrong approach for me. In 2000, when I was successful, I was very public about the attempt. This time I decided to amp up just how public I am. The day I started the journey I started this blog. I told every friend and relative what I was going to do. For me, this high level of public accountability has made the difference, even more than I had expected. Through my friends and family I have received support and encouragement, but the unexpected benefit has come from those who have chosen to follow my blog. There are a lot of us out there trying to do this same thing. Finding this community on the web has been very helpful to keeping me on track. Are there any foods you have given up? One of the reasons I chose Weight Watchers is that it is not a diet of exclusion. On Weight Watchers I can literally eat any food I want, as long as I accurately track the points. If I want to stay on points for the day, and not be ravenously hungry, then it is in my best interest to eat foods that are lower calorie density by volume. I also have learned how much protein keeps me from being hungry. All that is part of the program. I have, voluntarily, stopped eating some foods. I have written about them previously on this blog. Recently I have made a couple of other changes as well. I almost never have mayonnaise. I have never really been a fan of the taste, and have eliminated it from being a condiment. The exceptions are Cole Slaw and Tuna Noodle Salad, but I eat both of those only rarely. I almost never eat salad dressing. I will write about this more extensively, but basically I don’t want to give up the points. And, I have found that I really like the natural, fresh flavors of the vegetables in a salad. When I do need a bit more taste, I will add some apple cider vinegar or balsamic vinegar. Neither of those have points for the quantities I am using. Is there anything you eat that helps? There are a lot of things that I eat that help, but the thing that I want to focus on here is Frank’s Hot Sauce. Like the commercial says, “I put that sh-t on everything”. My son is staying with us for a while, and he introduced me to this idea. That bowl of Skinny Pop Popcorn (which is already very light), is topped with some Franks, and let me tell you, it is delicious. 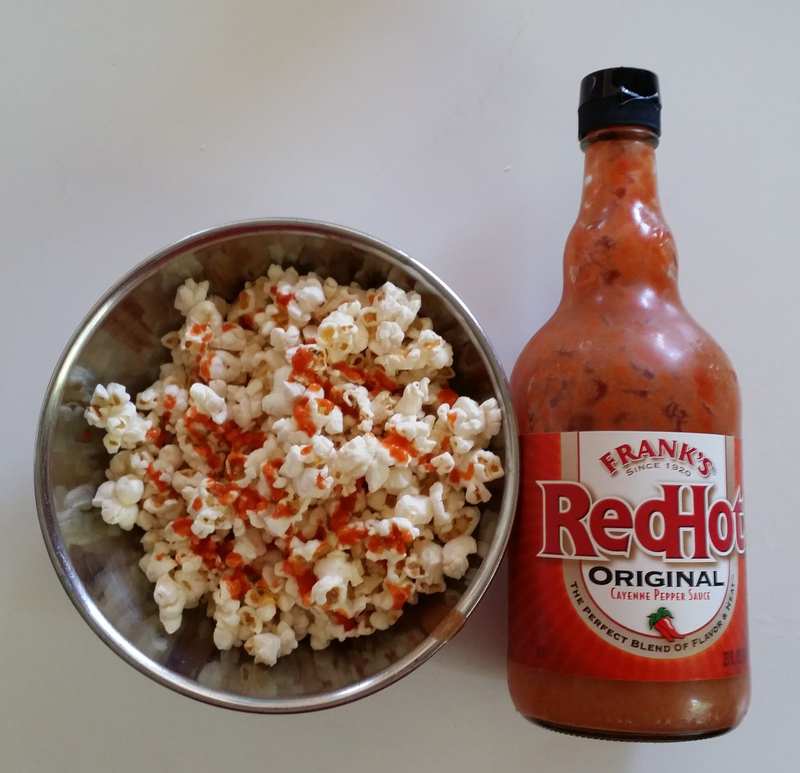 The Franks adds a great taste to the popcorn, and it has the added benefit of limiting how much I eat. After a serving that size, my lips are generally numb, and I don’t want to eat any more. One other added benefit is the water I drink to go with it. Hamburger – I have only used it as a topping, but my son has stuffed a burger with a healthy dose of Frank’s and says it adds a lot of flavor. I will be trying that soon. So, there you have it, some thoughts and answers to questions. I will keep track of other questions I get and post a similar set of FAQ in the future. You are exactly right, Bobby! I always tell people that mindset is everything! If you aren’t at the point that you have made up your mind to lose the weight, it’s not going to happen. Believe me, I spent plenty of years in that place myself. And I LOVE Frank’s Red Hot Sauce!!! I use it everyday! It is great for giving food a kick! So, Kassie… we are the lucky ones, right? We have the mindset and motivation. How do we help spark others? I want everyone to feel this good. Bobby, that is my goal. To help is many people as I can achieve health and wellness. So much so that I am earning my personal trainer and health coach certifications and starting my own wellness coach business. My journey became so powerful for me that it changed the direction of my life completely. I want everyone to know it’s possible and they CAN do it!!! Your dedication is amazing, and I have no doubt that those who come to you will benefit greatly. Today I am wondering how we can inspire others to find their inner motivation so they will come find you and people like you. I wrote about motivation in my other blog today. Bob, you rock! I love reading your blog.